This Class Would Make University Fun! Johns Hopkins University in Baltimore, Md., has created a class around the gritty TV series The Wire, which was set in the city. The undergraduate class in public health examines 60 episodes of the award-winning series as a way of looking at the problems of big cities in the U.S. 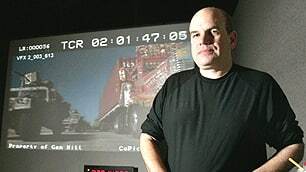 The Wire creator David Simon, a former Baltimore crime reporter, spoke to the Johns Hopkins class about the show, which last aired in March 2008. (Reed Saxon/Associated Press)The series, which ran from 2002 to 2008 on HBO, was a highly acclaimed crime drama that cast an unflinching eye on various aspects of Baltimore — such as the city bureaucracy, the drug trade and the school system. Called “Baltimore and The Wire: A Focus on Major Urban Issues,” the course is the brainchild of Peter Beilenson, a former city health commissioner and now a county health officer. Beilenson said he felt the show depicted real-world challenges that would benefit his students. “It is a frighteningly accurate portrait of life in some parts of Baltimore … and in many other cities through the United States,” he told the university newspaper, the JHU Gazette, in October. Co-created by former Baltimore crime reporter David Simon, the show has been lauded for its sociopolitical bent and its realistic explorations of life in the city for different citizens and of how civic institutions fail individuals. Simon was also the creator of the police drama Homicide: Life on the Streets. The Wire’s stories are based on the experiences of Simon’s writing partner, Ed Burns, a former homicide detective. So far, the class has had a host of guest speakers including Simon, Ed Norris, the former Baltimore commissioner who became an actor on the show, and Baltimore schools CEO Andrés Alonso. Students also visited needle-exchange sites and juvenile justice centres. Their final assignment requires them to write a memo that would suggest solutions to fixing problems in the city. The Wire is already taught in other post-secondary institutions including Harvard and Duke universities but this marks the first time it’s being utilized by a Baltimore learning institution. The Johns Hopkins course is the only one to tap into the people who worked on the show and the city officials whose jobs are portrayed in the series.